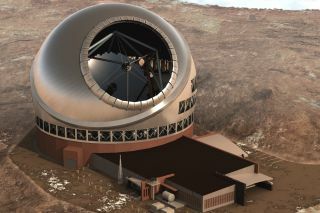 Artist's illustration of the Thirty Meter Telescope atop Mauna Kea in Hawaii. Construction of a gigantic telescope in Hawaii has encountered yet another serious setback. The Hawaii Supreme Court has pulled the construction permit for the Thirty Meter Telescope (TMT) indefinitely, saying the state granted the permit without following proper procedures regarding a petition filed by groups opposed to the project, The Atlantic reported today (Dec. 3). The $1.4 billion TMT, which is being built atop Hawaii's Mauna Kea volcano, will combine 492 mirror segments to form one light-gathering surface 98 feet (30 meters) wide. When it's up and running in the early 2020s, the huge telescope will help astronomers find and characterize exoplanets, probe the nature of mysterious dark matter and dark energy, and tackle many other big cosmic questions, project representatives have said. But TMT's path to completion has long been bumpy. Native Hawaiians regard the peaks of the island chain as sacred, and activists have banded together to oppose the telescope project. Construction began amid protests in October 2014, for example, and demonstrations in March and April halted the building process for several months. At this point, it's unclear what the future holds for TMT. "We are assessing our next steps on the way forward," Henry Yang, Chair of the TMT International Observatory Board of Directors, said in a statement. "We appreciate and thank the people of Hawaii and our supporters from these last eight-plus years." TMT is one of three enormous telescopes scheduled to begin operations in the early to mid-2020s. The other two, the Giant Magellan Telescope and the European Extremely Large Telescope, are being built in the Chilean Andes.